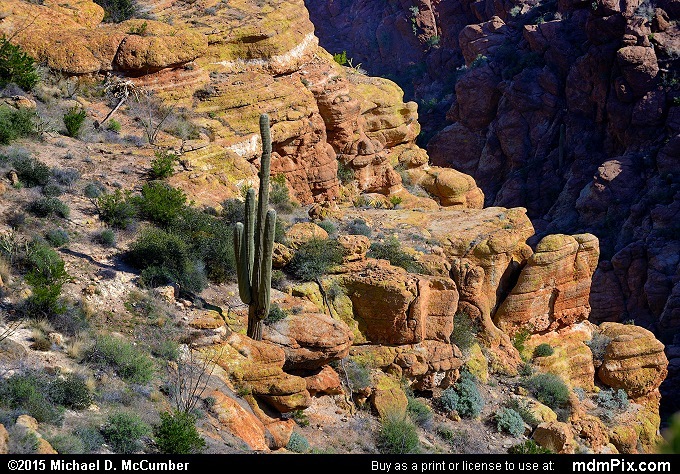 A Saguaro Cactus stands along a sunny slope of Volcanic Tuff rock, common in the Superstition Mountains, a short distance away from a deep and dark chasm for Fish Creek Canyon. Pyrite minerals are common in the rocks here giving them their gold color. This picture was taken a distance from the Apache Trail, a rugged road cut through these rough bad lands of rocky cliffs mountains and canyons east of Phoenix.